Heat the oil in a large saucepan and add the spices, onion, garlic and ginger. Cook, stirring all the time, until the spices release beautiful aromas. Be careful not to let them burn. Add all the other ingredients except for the stock, and cook for 3 -4 minutes until the sweet potato is coated in the spice mixture. Add the stock and simmer gently, covered, for about 30 minutes, or until the sweet potato is very soft and you can easily squash it with a wooden spoon. Blend the soup in a food processor, or with a stick blender, until it is smooth. If you like add a little extra stock or water to get the consistency you prefer. Taste and season with salt and pepper. 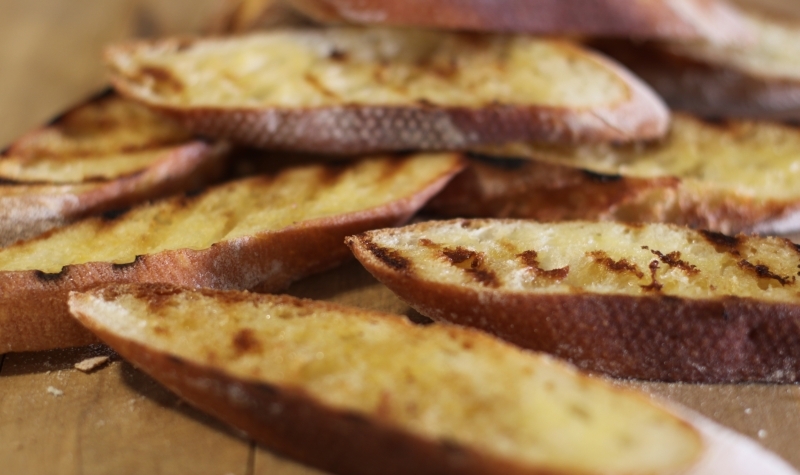 Serve hot with toasted bruschetta or crusty fresh bread with the yoghurt passed separately for everyone to add a spoonful to their soup. It will keep for 3 – 4 days in the refrigerator and also freezes well. Reblogged this on Simple food. What a beautiful soup! I will have to remember this when winter rolls around here in the Northern Hemisphere. 🙂 Works for me too! I’m working on a potato and leek soup – the queen of smooth soups. I’m cooking for a camp soon – 150 people – and serving soup for lunch and want to serve it there. 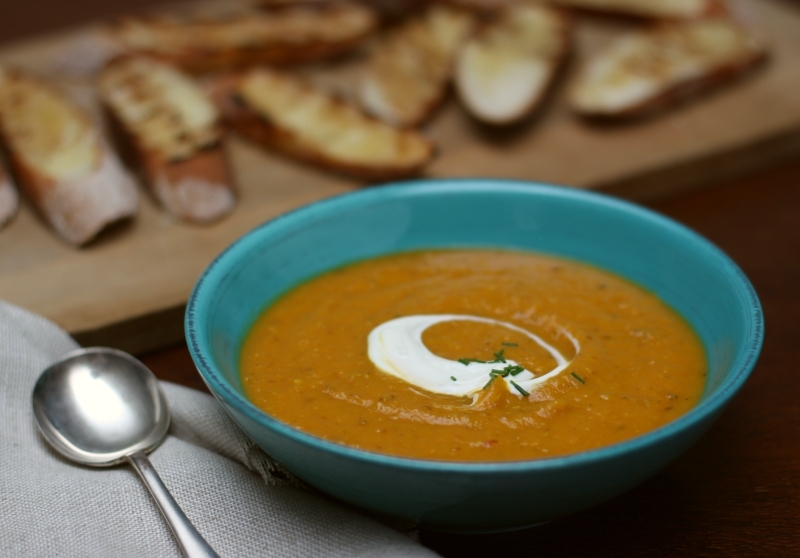 Is this one of your favourite combinations for soup? Pumpkin soup is a real favourite of mine, too. 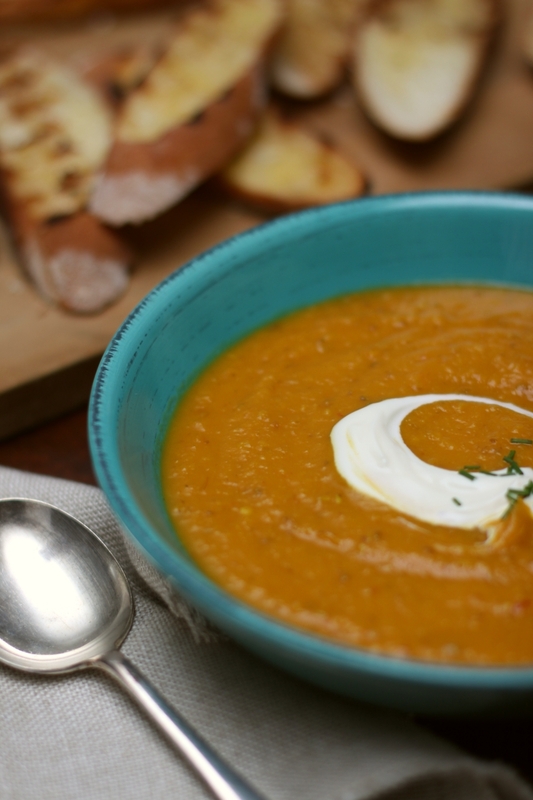 Hope you enjoy this soup when you finally have cold weather again. Am a bit jealous of all of you on the other side of the world – soaking up the summer sun. Enjoy!